During this period the world continued to turn, albeit with the washing having been blown a little harder by all the cyclones, and our friends and families lives carried on amidst all their own challenges and demands. As our last full day bloomed, the mountains near our camp site were in full view. We could see all three peaks as we raced along the state highway determined to get full value from our last hurrah. Tomorrow would be all about the return of the campervan and then over 24 hours travelling time back to Cyprus. We took a right hand turn from the main road and there it was! Mount Ngauruhoe sat amongst the barren landscape goading us to come closer as it did for Frodo Baggins and Samwise Gamgee in the Lord of the Rings. 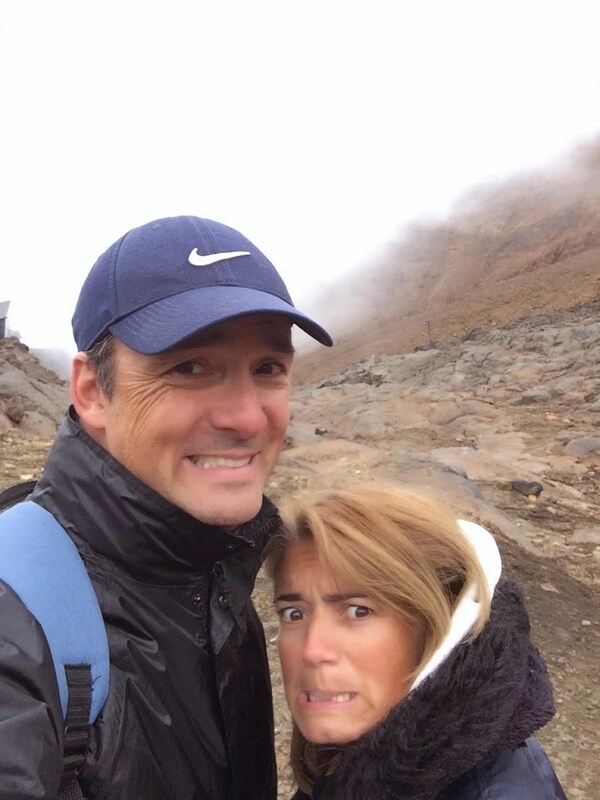 I nudged Michelle to take a picture and little did I realise that half an hour later the weather from Mordor would close in around our necks and our skin would bump with the cold presence of the Nazgul. The rumours were true, the weather here changes very quickly and we saw it in the faces of those who worked in the region. Lookin’ out a dirty ol’ window at Mt Doom! 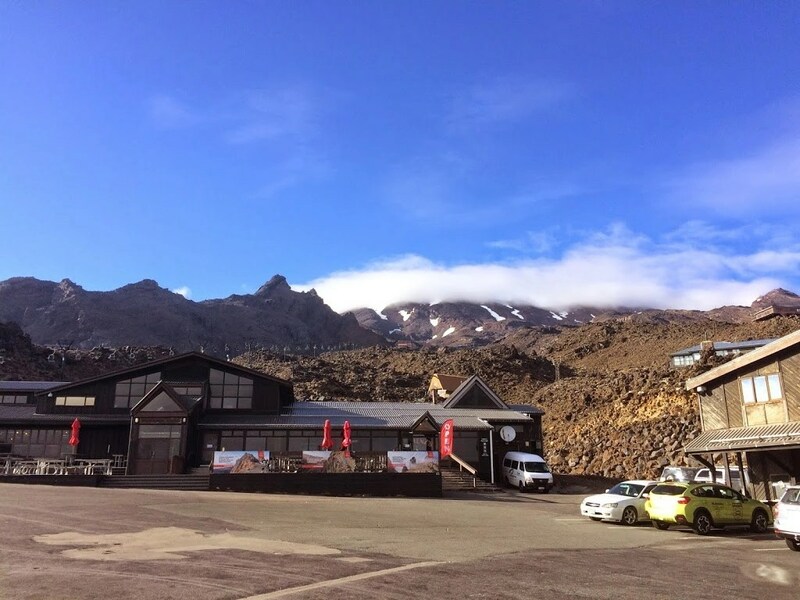 Although Mount Ngauruhoe is the darling of this region, the Tom Cruise of the peaks, the mountain we were heading to was Mount Ruapehu, an active volcano and the subject of a distant photograph we had taken on Day 95. 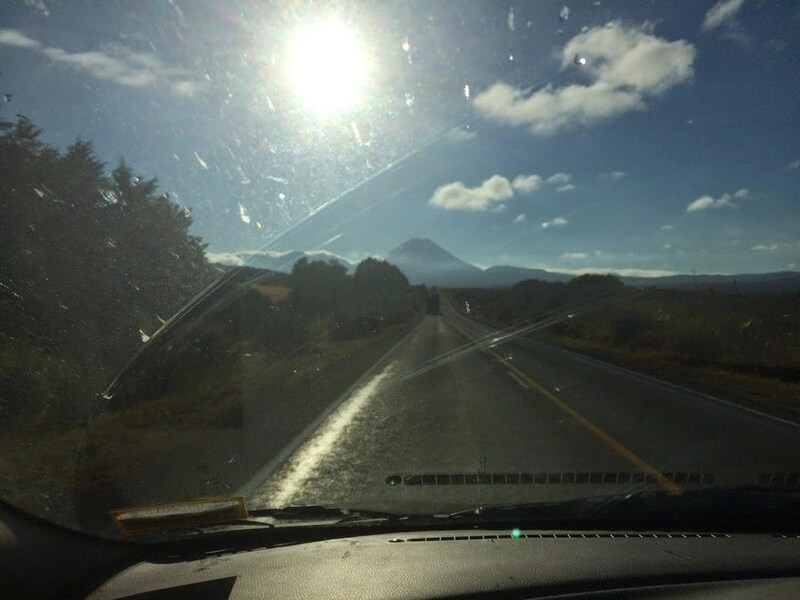 As we drove into Whakapapa Village we renewed our acquaitance with sulphurand this smell will always remind us of the North Island. It seeps into all your clothing and, at times, feels like a cologne made from coal by Orcs, or Orcsies, as Gollum would say. It is always wise to check the weather before entering any mountain area. Are the conditions good and are we appropriately dressed? The man from tourist information looked over the counter at us and his eyes told us that our footwear was hardly the sort that would withstand the beating the mountain was going to impart. He advised us that there was a lovely cafe at the top and some walks that could be tackled in our accouterments. We nodded, hastened out of the room and finished the last 15 minutes of the journey with Michelle saying that we really ought to take some better pictures of Mount Doom! Mr Blue Sky is about to leave us! As usual, I was more concerned with reaching our destination thinking that the view from the top of the mountain would be the shot we would always remember. 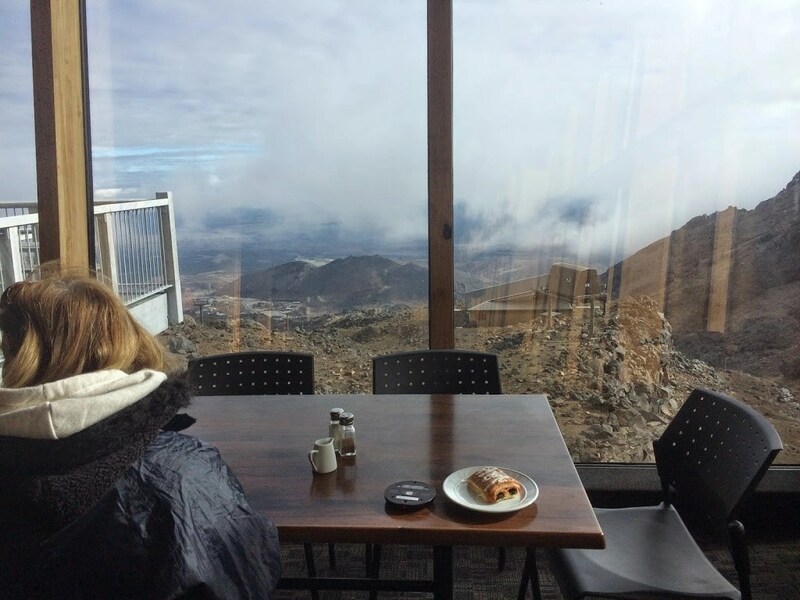 By the time we had reached the first cafe (where we could purchase the tickets for the two chair lifts to take us to the highest cafe in New Zealand) the day was beginning to change and Mt Doom was not visible behind a hill we had parked behind. “Perhaps, it is just passing” I said, as Michelle returned with the chair lift tickets and as we jumped on and pulled down the safety bar a silence descended around our now still hearts leading us to question what the hell we were doing ascending a mountain that likes to erupt every now and again? As the cable car took us higher I think this got to Michelle, and it wasn’t until we felt the elixir of tea and coffee warming us up again in the cafe at the top that all the morbid thoughts were vanquished. Don’t look now but the weather is closing in! They returned though as we stepped back outside to a gathering gloom. We could see that to make the recommended walk would mean disappearing into a slippery murk from where we may not be able to find our way back. We had been informed at the bottom that if the weather closed in that they would close the chair lifts and having seen that this climb was also hazardous (and long) we elected to get the hell out of Dodge before we turned back into the Griswalds. 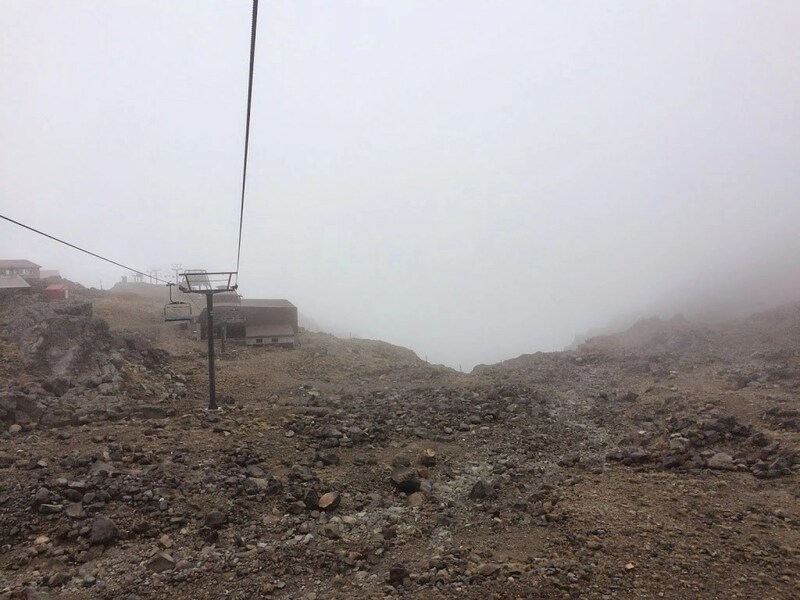 As the chairs returned us to the Jucy Cabana, the whole mountain fell into a fog and we could hardly see the chair in front of us. I did glance over my shoulder though and was transported to the track that Frodo and Sam took to reach the summit of Mount Doom and attempt to destroy the ring of power. Directly below us was the place that this was filmed and with the way the mountain was being presented on this day all that was needed was a little fire and the cast, and the picture would be complete. They closed the chair lift just as we exited. It was a close escape and for once our inbuilt sensible compass took us in the right direction. On this day, he who dares gets stuck on a mountain side and has a long walk home! 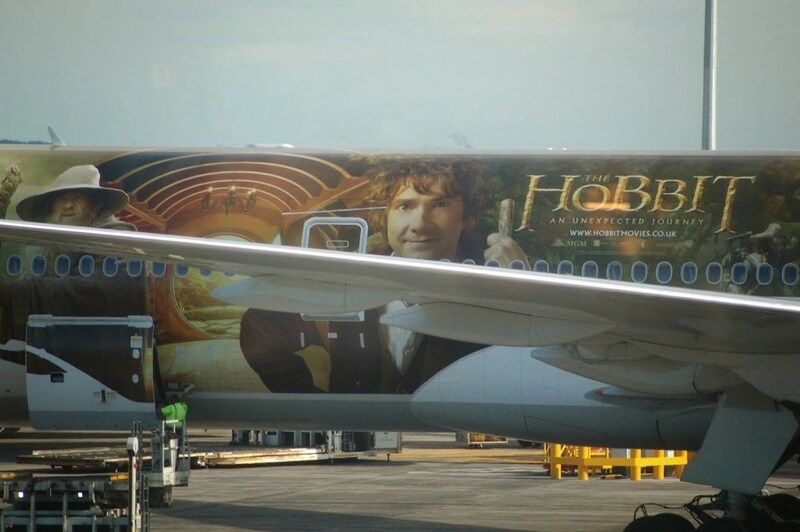 Nice Hobbitsies come with Smeagol! 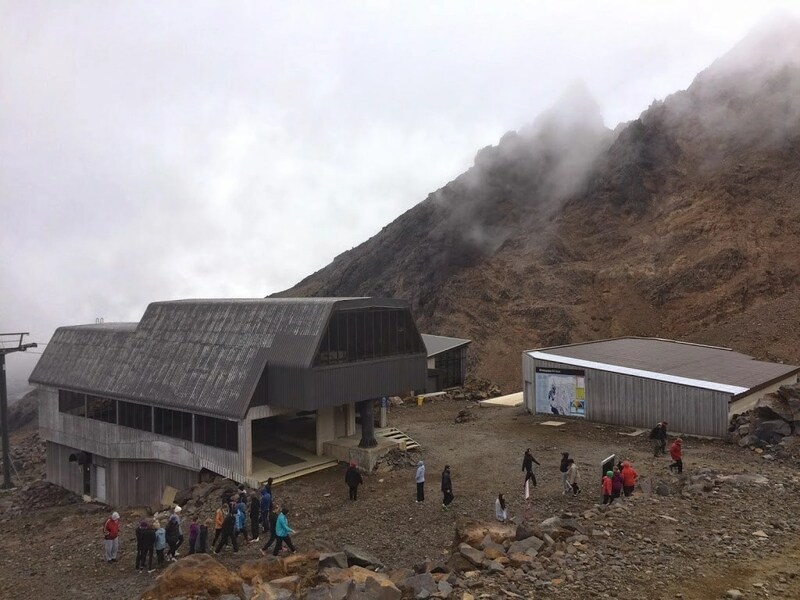 As we drove away from Mount Ruapehu we saw the base of Mount Ngauruhoe and that was it. It’s iconic summit shaped like an upturned plum duff covered in grey cloud: it certainly wouldn’t be seen again that day. That was it! Or was it? Driving north, we headed west of the mountains seeing different villages to those we had seen on the way down. 3 hours later after stopping in a real life version of the shire in lovely sunshine, we arrived in Pukekohe. The weather here was much warmer and our mountain adventure seemed like a dream. Poco Loco tapas bar gave us the best send off. We ordered a six dish tapas with such delights as fried scallops and balsamic chorizo to melt in our mouths. Accompanied by a glass of red Borsao Garnacha and white Oyster Bay Marlborough Sauvignon Blanc we were good for our last night in the Cabana. Waking to the itching of farewell mosquito bites, we headed into Auckland airport, which, thankfully, is south of the city and were soon unloading our bags at the terminal. Little did we realise that the triumphant New Zealand cricket team had just walked through applauded by everyone and no doubt heading to the MCG in preparation for the World Cup final. Doh! 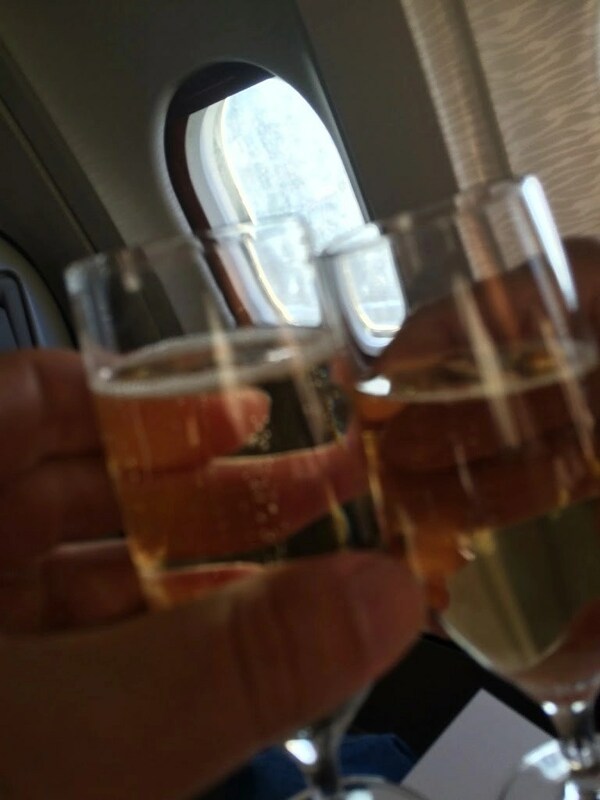 25 Hours and 2 flights later – the second upgraded to Business Class – thank you Emirates, (perhaps they had read the blogs), and we were reunited with Michelle’s uncle Chris and Taz. Drinking at 7 in the morning! Since last May I have been chewing on an old piece of gum. You know, one of those that has lost all flavour, and then you realise it’s still in your mouth long past the flavour has gone. I cursed what life kept throwing at me and felt sorry for myself as my head hit the pillow each night. 9 months later and the clock of life has spun faster than the fastest setting on HG Wells’ ‘Time Machine’. I realise now that it was not just my body that needed fixing it was also my mind. The illusion that we are all somehow in control of our destiny is the question that I had wrangled with the most. What is destiny? Is it getting to Christmas Day and being smothered in gifts? Is it a distant beach underneath a Palm tree? Is it finishing that next project at work? These are words that have stayed with me throughout the last few months but more than that, so much more than that, is a sign that we saw in Titahi Bay, New Zealand. 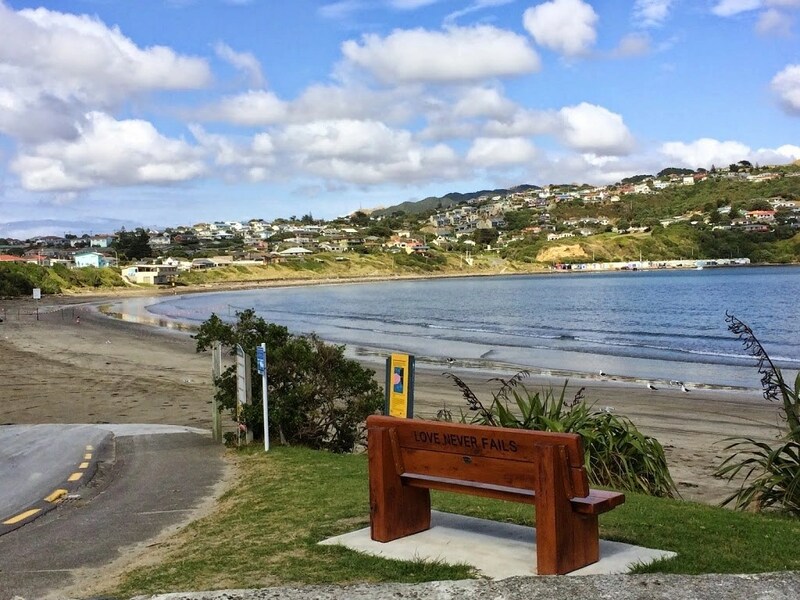 On the back of a double wooden seat overlooking the beach there was an inscription. It is only now since we have been parted from so many people we know, that I realise what this trip was all about. Although it was partly to see some of earths amazing treasures both hidden and in full sight, it was to be filled with the hope of a future that exists with the love that never fails between people. Slowly but surely, my flat tyre has been inflated by that love. From the full blown send off in December to public and private messages sent through Facebook. From the help we received in Cyprus to the unerring support group at home. From the giving and generous AirBnB host in Perth, to a lady who made us pancakes to make us feel good in Cairns. From the loving upbeat spirit of both the Aussies and the Kiwis to FaceTime calls with our thrilled and beautiful parents. To the words of encouragement while I blog. In them all, we felt the affection and camaraderie like we were all living the holiday together. Love has never failed me once, it took my incredible wife and amazing son to remind me of theirs. It took everyone else to make me feel like a prizefighter again. We have taken this journey and loved every single second, allowing all the experiences to soak in so that we can wring them out with all our friends and family over the coming year. You lucky people! If these blogs have one lasting legacy it will hopefully be that in some very small way anyone reading this compendium of intestinal nonsense will find inspiration to not only make every minute count but to make them special. To slightly amend one of Mr Spock’s sayings I would not say ‘Live long and prosper’ for that is an assumption that living long is a good thing and it may not be. I would say ‘Live well and prosper’ and may you get a chance to see all the beauty this amazing world has to offer. It is a round ball of cliff edges and potential tragedies at every turn, and yet it is a colourful masterpiece, an interfusion of the great artists like Rembrandt and Constable. It is our planet and it is up to us to see it and then ensure all our kids do too. Our only companion on this southerly odyssey has been time. We immediately began to live hours before others. Whilst the clock struck midnight in the UK, in New Zealand we were contemplating an afternoon lunch. In the 13 years I spent working for Kent Police I have realised that too many of them injected vials of poison into me. This was mainly my fault. I had begun to build a cocoon around my existence and believed that this outer shell would be impregnable. What I failed to realise is that this is also unbreakable from the inside too! I will search now for a simple life. One that is not crowded by my own expectations of how I and others should behave and I thank everyone for being a part of it, however small, because the one chance we get shouldn’t be wasted. 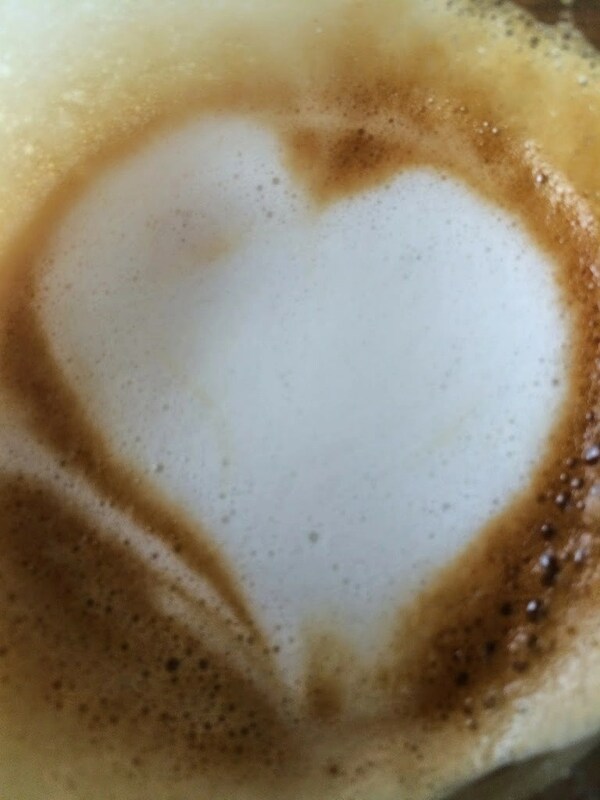 It should be held and we should reach higher than is possible to attain all our dreams. 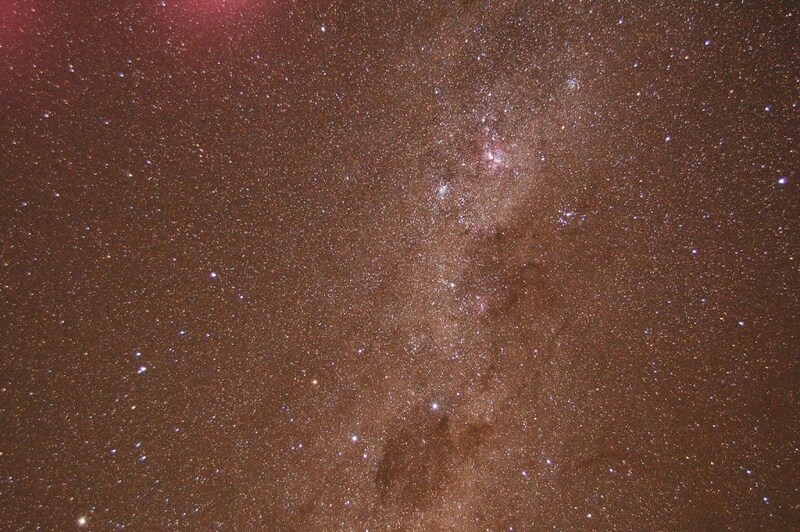 At the Mt John Observatory I could almost reach up and touch the stars and perhaps If I tried a little harder I really could, I reealllly could! Now, I really must write that book!